Hello! 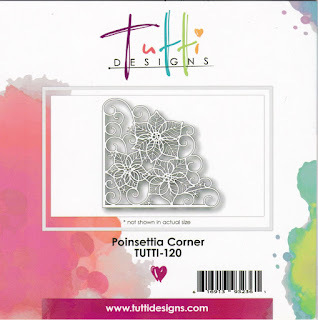 Pinky here sharing a card I made using this gorgeous Poinsettia Corner die. I decided I wanted to layer the die cut as I went along so I started off cutting it in gold mirri card. to glue them on top of the gold poinsettias. gold candi to each one. On the back I added a 3d foam square so I could get some dimension. I slightly shaped each flower with my shaping tool. I then layered them on top of the original cuts. and added the Poinsettia Corner using glue. I finished my card with some red faux stitching and added a sentiment from my stash. FANTASTIC Pinky! Beautiful way you turned this corner die into a two tone accent! Great inspiration ... thanks! That's so pretty! I love the gold with the red...so elegant! Beautiful, Pinky! This is one of my favorite corner dies! Using metallic paper makes this card so elegant. Great dimension with the flowers.